Regen Power presents the ultra efficient, zero energy cost solar pool pumps to keep your pools sparkling clean all day long. Switch now and save thousands of dollars on annual energy costs while reducing your carbon footprint. The solar pump can be stand- alone (for new installations) or can be retrofitted with an existing mains powered pool pump. Australia is known all around the world for its fabulous climate and its long and hot summers. For this reason, Australia has the highest pool ownership per capita in the world with about 1.6 million residential pools and more than 30,000 new ones added each year. A pool pump is the heart of the pools filtration system; without it, the pool would lose its sparkle and soon turn green. 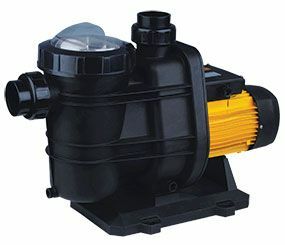 In households with swimming pools, the pool pump-unit is usually the largest single electricity user. Time requirements for pool filtering vary from home to home due to differences in pool volume and equipment, the amount of use and environmental factors. As a general rule, one complete water turnover every 24 hours will provide adequate filtering for a residential or a small resort swimming pool. The average recommended running time for the swimming pool filtration system is about 8 hours in summer (heavy use), and about 4 hours in winter (hardly any usage). The annual total pump operating time is about 2200 hours. 75% of all residential pools use a standard 1HP, 240 volt (single phase) AC pump (Fig 1) consuming around 2000 units (kWh) per annum. Regen Power has engineered an efficient and cost effective solar photovoltaic (PV) powered swimming pool filtration system. This can be fitted to either a new installation or retrofitted to an existing pool. Regen's solar pool pumping system uses a high efficiency DC (Direct Current) brushless motor coupled to a centrifugal pump. The brushless DC motor solar pump is much more efficient than a conventional mains powered pool pump. The motor is connected to solar panels through a controller. The controller controls the speed of the pump and optimises the amount of water pumped based on the available solar radiation. Regen pool pump and controller will suit pools of up to 70,000 litres. Low voltage DC electricity is provided by a maximum of four 250 watt solar panels through a controller that will extract maximum power from the solar panels and run the pump at the optimum speed. For larger pools, 2 or more pumps can be connected in parallel. A case study was done on a residential below ground 65,000 litre salt water pool with automatic pool cleaner in Willetton, Western Australia.